Alexander Stevenson (1847-1916) was a self-made man forged in the Carron Works of Victorian Falkirk. He was the grandfather of ‘G,G’ (Constance Gibson) but she was just eight years old when he died. Wind the clock back, and I would love to ask my Granny what she knew of Alexander. But Granny died before I was interested in our family. In family history, stories die so quickly, if not captured they are lost. Time is indeed a fickle friend. 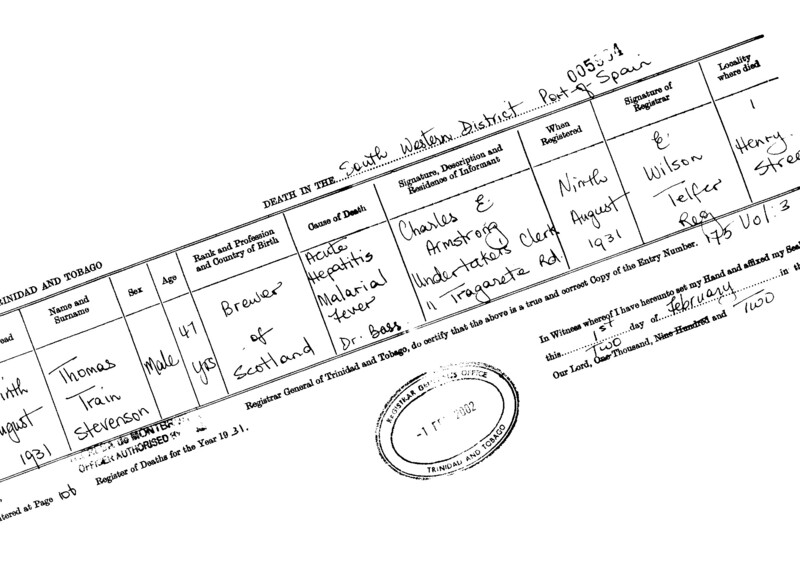 Falkirk and Carronside are now the haunts of Andrew and Rachel’s mum, for it is at Graeme Road Practice, Bainsford, that she now practices as a General Practitioner. It is a challenging job with high morbidity but made all the more worthwhile for being so. Do a good job and you save so much in the way of human misery, pain & distress. Alexander would never have made a good doctor! Why, well his handwriting was just far too good! His signature and declaration on his Testament survives to show the most beautiful script I have ever seen. Yes the superlative in this case matches the script: beautiful. It is all the more remarkable when you realise that Alexander was to a large part self-taught. Named after his father, Alexander Stevenson (1847-1916) was to become a most successful man, who developed from very humble beginnings. Born and raised in Fisherow, Falkirk, the son of a Foundry Furnace man, he initially worked alongside his father in the Foundry. At the age of eleven Alexander Stevenson went to work, his first employment being in filling the baskets at Carron Furnaces. The conditions of labour then were vastly different to what they now are, and Alexander had a task to fulfil, which considering his tender years, would now seem to be impossible of accomplishment. The Factory Acts were not then in operation, and there was, therefore, no restriction imposed either with regard to the age a lad went to work or the hours of his employment. Alexander was employed a fortnight on the night shift and fortnight on the dayshift alternately – twelve hours a day, and seven days per week. What a start for an eleven year old. How did he find time to write so well and to develop a calligrapher’s hand? And that, in no fear of understatement was the least of his successes. Alexander, still a boy, progressed to work which was much more to his liking, and he learned the trade of an irondresser under a Mr John Anderson, one time a member of Falkirk Parochial Board. When Grahamston Iron Works started, he was engaged by Bailie Mitchell, and was his foreman irondresser for a number of years. He subsequently filled a similar position in Gowanbank Foundry. Later he entered the spirit trade. Andrew was just a toddler learning to speak when I first started my quest for Alexander. The usual rounds of graveyards – the yardstick of all family historians – was undertaken. Poor Andrew will he ever forgive me for such grisly adventure – staring down at stank, moss-covered tombs. As a youngster I was taken to Glenmuick Churchyard by my father. With my sisters I was dispatched to read tombstones – luckily I had a good sense of humour as we collected a stack of ‘Peter Gordons!’ They are ‘all bones’ Catriona testily reminded me! So I apologise to Andrew now – sorry for the tombstones. A further clue was to be had, as my Aunt, Helen Brink remembered when as a child, during the war years, she attended a funeral to Alexander Stevenson’s son. She thought she remembered that the tombstone was an ‘Angel.’ Fortune was shining on Camelon Cemetery that day and shone specifically on Sian, for it was she that amidst literally Legions of Victorian Monuments found the Stevenson tombstone: ‘Here is the Angel!’ she shouted across the sleeping rows. There was some mirth when the tombstone was found – not for any material condition, but because of the name on one of the lower inscriptions, for one of Alexander’s sons, was called ‘Thomas Train!’ Andrew you see was besotted by Thomas the Tank Engine. His wooden Thomas went everywhere with him, and to his parents, the trains became as much their friends as they did to Andrew. Yes we loved Thomas the Tank. It was only later, that I discovered the origins of ‘Thomas Train,’ learning that in his early days, having moved on from the Foundry, that Alexander Stevenson was appointed to represent, as a traveller, the firm of Thomas Train and Co., a well-known Glasgow wholesale house. He ultimately started business on his own, but not before respecting the opportunity his employers had given him by honouring them in the name of his fourth son. Thomas Train was one of ten children born to Alexander Stevenson and Fanny Callander who were married on the last Friday of April 1867 at old Fisherow in Falkirk. They were to have a long embracing marriage passing into their fiftieth year, though Alexander sadly died months short of what would have been their glorious Golden Wedding celebration. Their first son Alexander went on to study Divinity at Glasgow University but died as the result of Typhoid aged just 23 years. 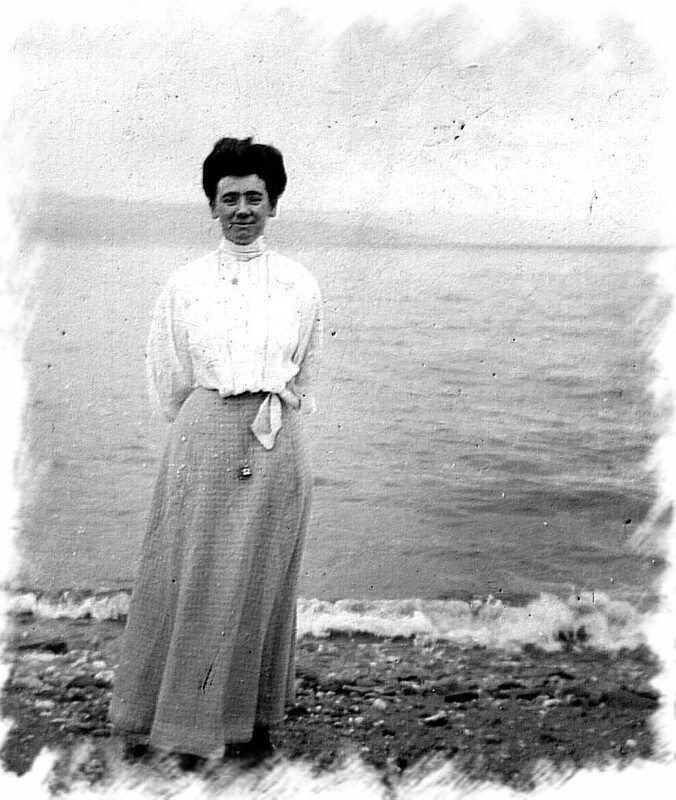 Their next child Peggy, born in 1869, married a commercial traveller and their daughter Lexie became my granny’s favourite cousin. ‘G.G’ used to explain how she went to stay with Lexie at Bucksburn Aberdeen and how they enjoyed dancing (and the boys!) at the Beach Ballroom on Aberdeen’s Beach Boulevard. I used to tell my Gran how he I had also danced there during my time at Aberdeen University and how the dance-floor used to bounce “Oh yes” said ‘G,G’ and her eyes would light up! The next child that Fanny gave to Alexander was Bessie (1871-1942), she married a Hotelier of the name George Wright in 1895. One can only assume that Alexander Stevenson, her father, did not approve as Bessie was more-or-less written out of his Will, and was the only child of his to be dismissed so. Heartache lurks behind that for sure. The next child born was Willie. He was born at Walkens, Grahamston in January of 1873. He was never to marry but nevertheless had a keen eye for the ladies. ‘G,G’ did not like him and called him an ‘old rascal.’ He used to bet and liked to drink. He was on occasion known to share a round with Rab Scott (who was at this time estranged from his wife Constance – ‘G,G’). Willie Stevenson trained as a solicitor and had his time in civic duty just like his father and was appointed Provost of Falkirk Burgh. In 1934 he declared open the newly built Kincardine Bridge. 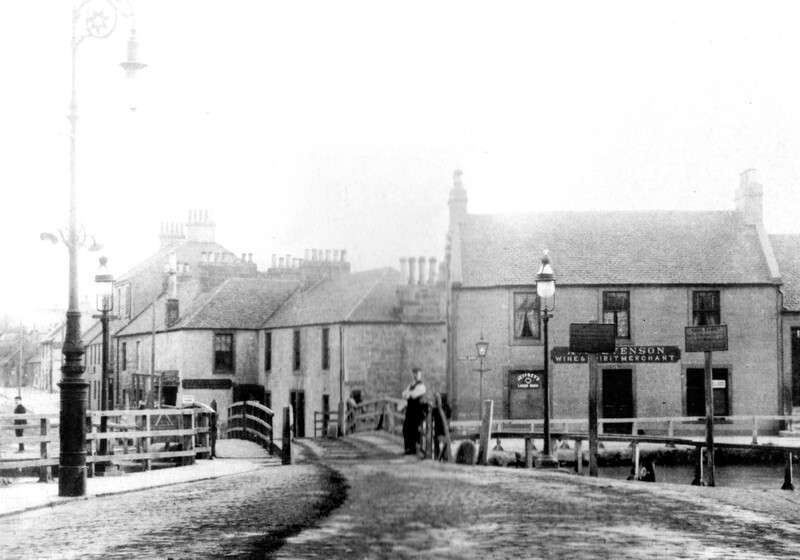 In May 1901 ex-Provost Stevenson established himself in business as a solicitor in Falkirk. From then until 1933, he occupied premises at 2 Bank Street, and from there he removed to his firm’s present premises in Kirk Wynd. Willie served as a Magistrate for five years, and was convener of the Fire Brigade Committee. At the time he took over the convenership the fire engine was of the horse-drawn variety, and the firemen were involved in the laborious task of pumping the water by hand. At that time the fire station premises consisted of a small place underneath the hall belonging to Lodge St. John (No.16). The Brigade in these days was called out by policeman going through the town blowing whistles. When the Brigade was taken over by the National Fire Service in 1941 there were two powerful motor fire-engines, modern fire-fighting and life-saving equipment, while the firemen were called out simultaneously by electric bells installed in their homes. 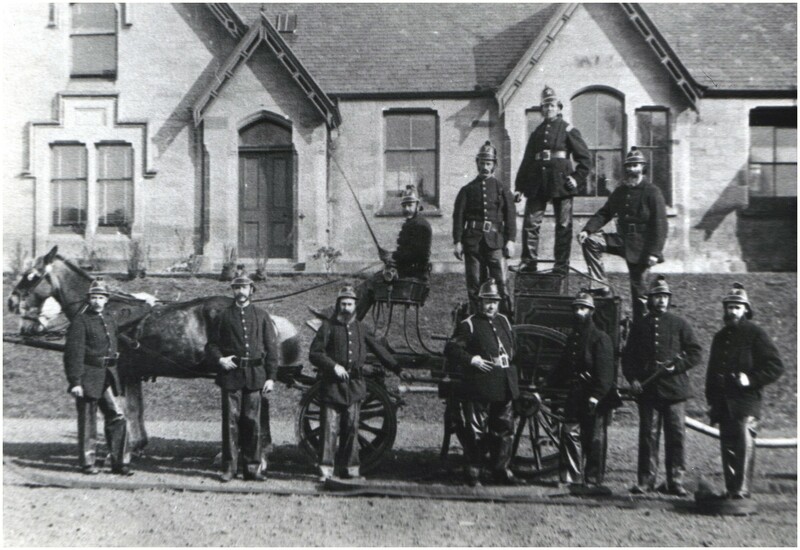 The previous picture illustrates the sort of Fire Engine, horse-drawn, that served when Willie Stevenson came to be convener of the Fire Brigade Committee. The attentive may have seen this photograph before, as it was part of the manuscript drawn up by me in 2003 and called: ‘The Medicine is in Aberdeen.’ This was the Fire Engine of William Cousine who built Mossgrove (though he called it Moss Cottage.) This, the family home of Andrew and Rachel, was built in 1880 by William Cousine, he was the small (under 5ft), rotund, ruddy cheeked, ginger-whiskered Captain of the Fire Brigade – indeed the village’s first official fireman. Apparently he was a bombastic man, unmarried and unpopular with the villagers. He used to shout orders to his men from the top of the horse-drawn fire engine. 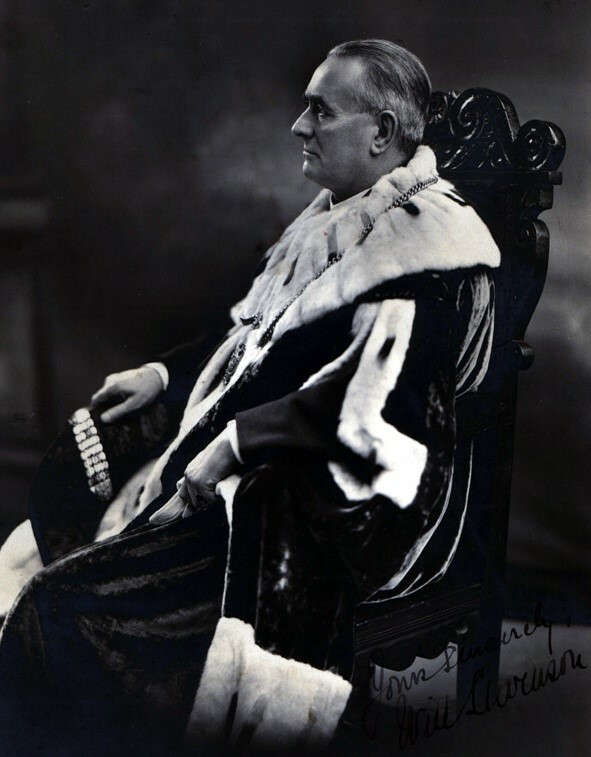 In November 1934 Mr Stevenson was elevated to the Provost’s chair, and held the office for three years. As civic head of the burgh, he carried out his multifarious duties with acceptance to all classes. He was kindly and courteous to all who approached him, and in many quiet ways he did much good. 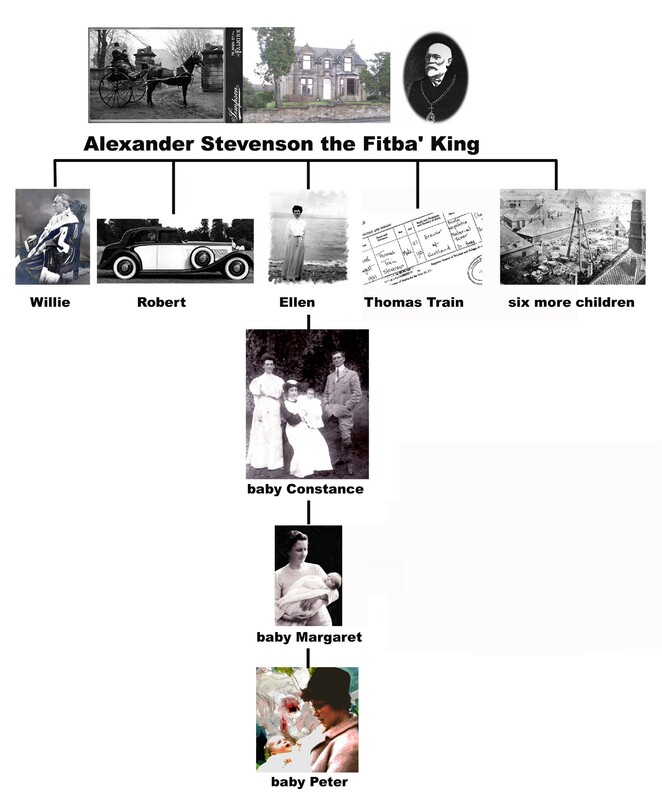 The next child to come along to Alexander Stevenson and Fanny was Robert Adam, or ‘Bob’ as he was known. Bob Stevenson (1875-1951) was to become a Grocer in Falkirk, following in his father’s footsteps. In 1906 married Jessie Alston from Broughty Ferry. Later on in life they moved to Newtonmore and ran the Balvaig Arms Hotel. When he died in 1951 he left a massive estate to his wife and his Rolls Royce, RS 4695, manufactured in the year 1935. One wonders what became of that fine car as the couple had no children to leave it to? Fanny was the next child born; she married the solicitor David Mungo and lived between 1877 and 1932. They had no children together. Fanny was buried under the Angel, beside her mother & father in Camelon. Ellen Callander Stevenson (1879-1961) is remembered by her granddaughter Margaret Scott, as like auld ‘Ma Broon’ she had a rotund mxyodematous appearance in old age and relied, in her later years, very heavily upon her daughter. 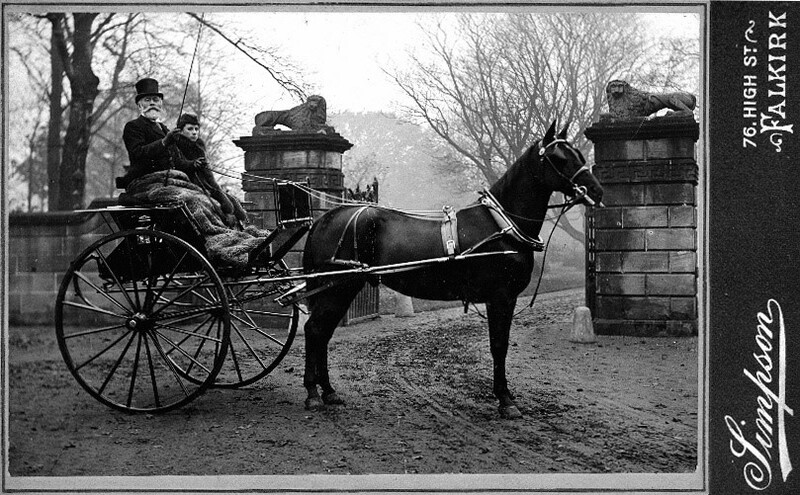 However two more youthful images have been preserved – one of Ellen by the sea in flowing dress, and the other sitting aside her father in horse and trap at the gates to Callander House. Three more children were to follow Ellen; Thomas Train has been dealt with; next there was Polly (1883-1966) who’s son Billy Scott and was another favoured cousin of my Granny. 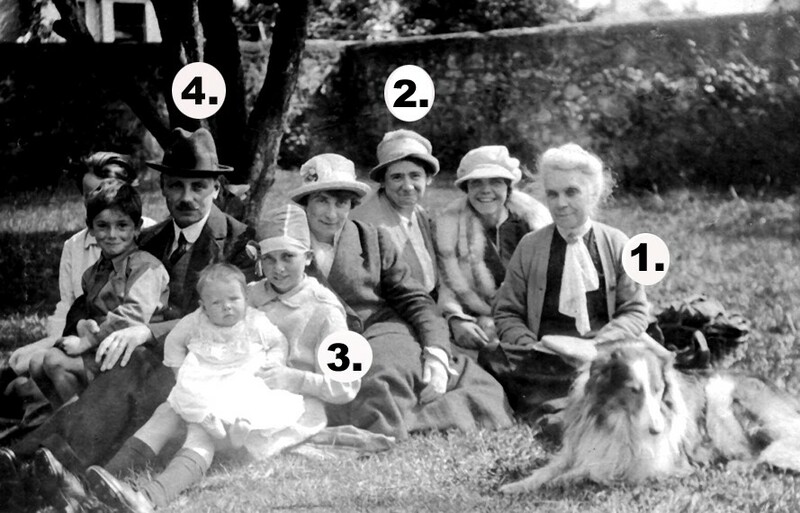 The final child was Ross Callander Stevenson (1884-1930). Granny recalled that he wore a wig, was a great sportsman (like his father,) but that he died young to Tuberculosis. Later, but probably not much later, Alexander entered the spirit trade. 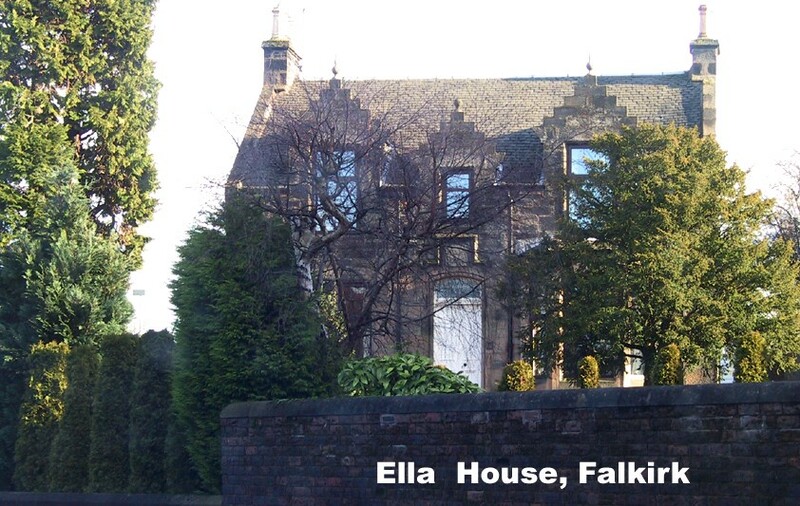 He had at least two properties in Falkirk, one was at 106 Graham’s Road, and one property in Glasgow at 145 Eyegate. The value of Alexander Stevenson’s service as a Town Councillor representative of the North Ward were fittingly recognised by the ratepayers on the 17th of January 1906, when, at a banquet held in the Union Halls, he was presented with a ‘beautifully illuminated and appropriately worded address,’ and Mrs Stevenson was made the recipient of a valuable silver candelabra. Alexander Stevenson was the keenest of sportsman. In this connection he had a reputation which was a national one, chiefly because of the prominent position he has occupied in Scottish Football circles. Indeed for five years he was President of the Scottish Football Association, where he gave “dignity to the chair, and his practical commonsense policy and experience were of the utmost benefit to that body.” He was one of the association’s committee, who, by their acumen, saved the situation for the association when its very existence was threatened at the time of the Ibrox disaster. Outside of that body he interested himself greatly in the affairs of the Falkirk Football Club, and was twenty years it’s President. The centenary of the Scottish Football Associations inception was held in September 2003. When it was broadcast, I could not help thinking of Alexander, and how as the signatee amongst five, he brought this professional body into being, and one that now oversees a multi-billion, multi-media game. So great has been the meteoric rise of Football, that surely Alexander would have been utterly dumfounded by its progress! If Falkirk could make it back to the Premier Division, the dreams of this ‘bairn’ would surely be complete! It is worthy of note that of the six clubs that formed the SFA none were of the Glasgow clan and indeed the list that formed was, by today’s guide, somewhat surprising . It demonstrates how the game has changed since the SFA was brought into being on the Twenty-sixth day of September, Nineteen hundred and three. Alexander was an all round sportsman and the editorial has sentiment that is rather forceful if not boastful. 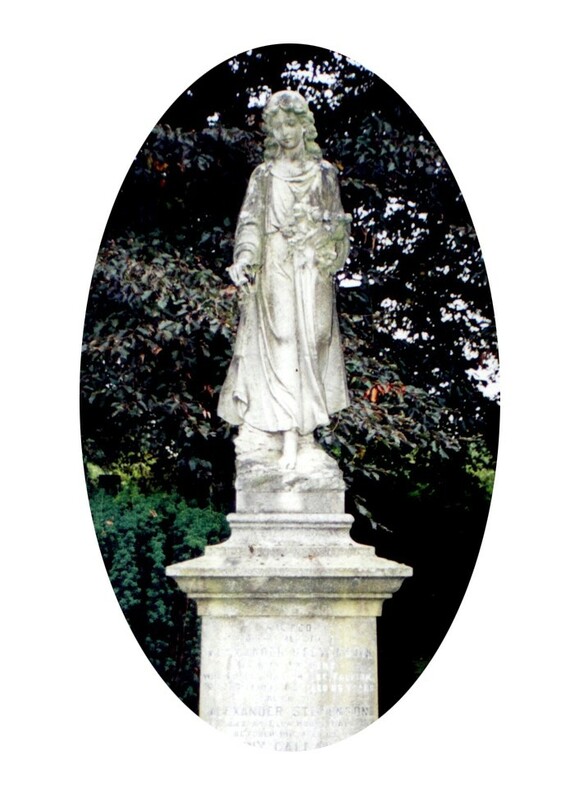 He was a keen bowler at Bainsford Bowling Green and gifted a handsome trophy, known as “The Stevenson Bowling Trophy,” for competition annually amongst the local bowling clubs. The chapter will close with the words given to the Falkirk Reporter in September 1904. They are the very expression of Alexander then aged 57 years. we talk a little before silence. about which subject they are securely ignorant. – a whisper is enough for us.